Many people didn’t like some changes that Microsoft implemented in Windows 8, for example – the most annoying part is the Start Screen. The Start Screen of Windows 8 has always been very controversial with many third-party programs coming out that allows you to customize it, or get back the Start Menu. The Start Screen surely seems to be lacking some much-needed customization options. You can pin any application (including the Modern and standard apps), and also change the background, but there are no customization options for tiles. That’s where a new application steps in called as OblyTile, developed by XDA member Argony-OT. OblyTile allows you to create custom tiles for any program on the Start Screen of Windows 8. Not only applications, but you can also create shortcuts/tiles for websites, network directories, or any files or folders that you want to quickly access from Start Screen. Using this application is very simple. 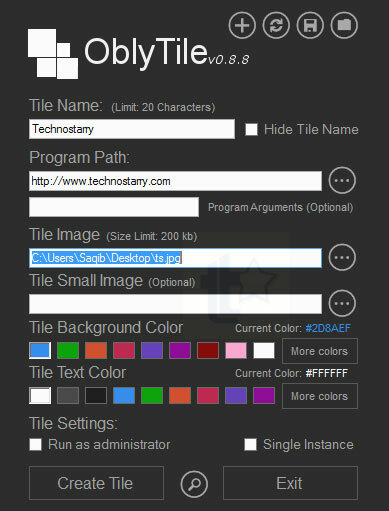 After launching it, enter a name for the tile, select a program (.exe file) path that you want to associate with the tile (you can also select a file, folder or website URL), select a tile image, select background and text color and then hit the “Create tile” button. You don’t need to create an image manually, as you’ll find many images from the Internet. When you’re done with the process, click on the magnifying glass icon to see a preview of the tile. If you like the preview, then go ahead and click on the Create Tile button. The tile will be instantly added to your Start Screen. Now you can drag and drop it to your preferred area. You can use the Tile Manager feature to speed up things. 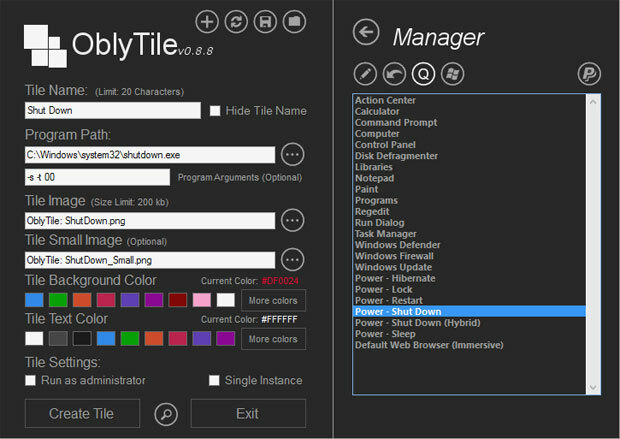 To use tile manager, click on the folder icon at the top-right corner of the OblyTile window, and then click on the “Quick List” button. From right-side, you can select pre-defined presets, think of this as shortcuts that are ready for you to use. For example, if you want to create a tile for restart, shutdown or for any other program like Notepad, Paint, Web browser, then just select it and then configure the settings if you wish to. Tile Manager lets you create tiles in a breeze, without the need to find an image, or do any other settings. This is a must have application if you want to easily add more useful tiles, or shortcuts to Windows 8 Start Screen. To top it up, it is portable, which means you don’t need to install it and free application. OrbyTile was tested on Windows 8 Pro 64-bit. It should work on both – 32-bit and 64-bit editions of Windows 8.